(Newser) – California Gov. Arnold Schwarzenegger helped popularize the Hummer by driving one, but he's not worried that its days of American ownership are over, reports the Los Angeles Times. 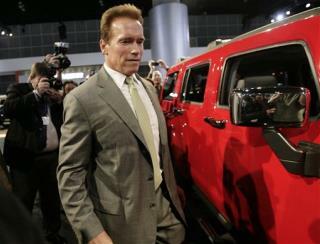 The gas-guzzler has come to symbolize Detroit's failure to innovate, and the brand's new Chinese owners will be able to double the Hummer’s gas mileage or even bring it close to 100 miles per gallon, according to Schwarzenegger. You do the best impression of a right-wing douchebag. It's high comedy! I salute you for your comedic efforts. "The gas-guzzler has come to symbolize Detroit's failure to innovate, and the brand's new Chinese owners will be able to double the Hummer’s gas mileage or even bring it close to 100 miles per gallon, according to Schwazenegger." Hey, Arnold! China is the biggest polluter on the planet; they don't have clown cars that get 100 mpg. Hey, Arnold! How's about fixing California so I don't have to pay more in federal taxes to bail out your state's failed liberal/socialist policies and programs? Arnold has his stories mixed up. Kind of like infidel911.